When we think of human rights, we often think of freedom of expression or the right to life, or the right to a fair trial. The Universal Declaration of Human Rights also includes the right to work and the right to a decent standard of living: “Everyone has the right to work, to free choice of employment, to just and favourable conditions of work and to protection against unemployment. … Everyone has the right to a standard of living adequate for the health and well-being of himself and of his family, including food, clothing, housing and medical care and necessary social services….” (Articles 23 & 25) Many people would consider it a good thing if people are able to create this decent standard of living through access to economic activity. And yet the restrictions placed by the Israeli government on Area C in the occupied West Bank are preventing sufficient development of economic activity to support the population. 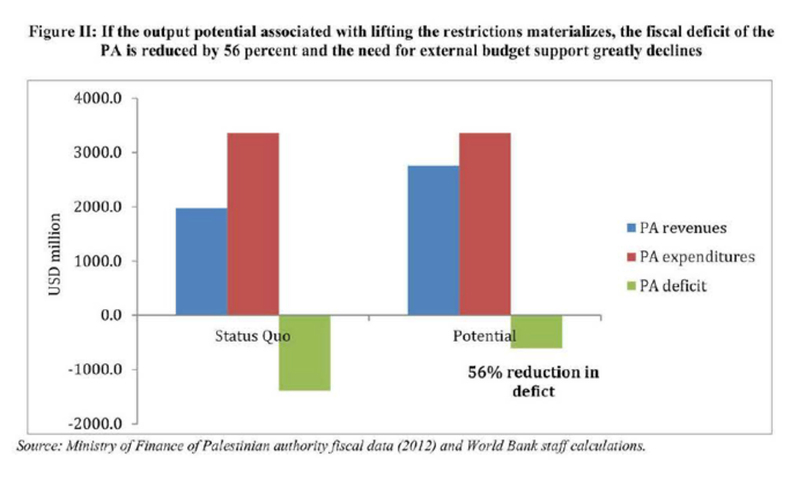 The World Bank economists who authored the study had the objective of understanding the mechanisms and impact of restrictions on the Palestinian economy. They chose six industries to study, including agriculture, quarrying, and tourism. Some ideas regarding the right to develop the land might contribute to a more sustainable economy but perhaps not to environmental sustainability. I am thinking particularly of a comparison with a resort on the Dead Sea in Jordan, and the proposal that Palestinians should be able to develop at least 6 km of resorts! Having been to Cancun, Mexico, and other places lined with resorts, I can’t say this seems to be either socially responsible or environmentally sustainable. 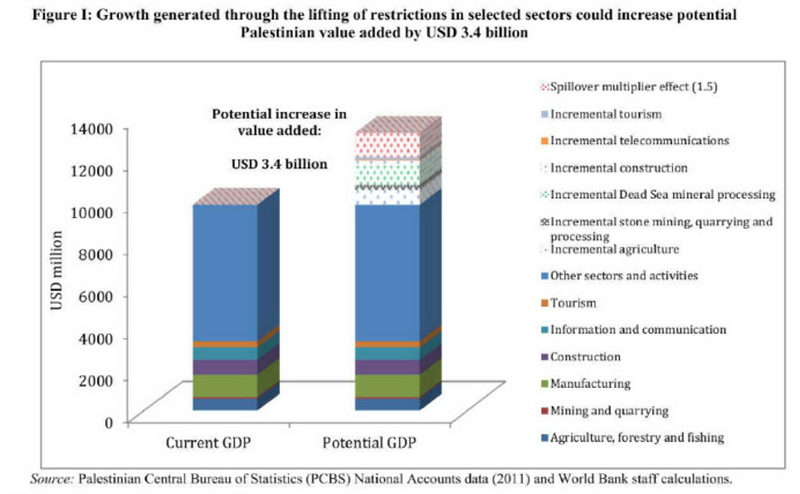 However, the main point does still hold: restrictions implemented by the Israeli government over Area C are preventing the development of local economic activity which would help locals support themselves and feed their families (an average of 3.5 children are born per woman among Palestinians living in the West Bank – and over 5 children are born to each Jewish woman living in the West Bank (most likely in a settlement)). Another example is agricultural production: removal of the restriction to construct irrigation infrastructure could help increase productivity in this water-limited climate. Irrigation can increase the financial gain from hectare of land approximately 13-fold, said the authors during their presentation. And these are real figures: they compare the output from rain-fed agriculture by Palestinians to output on irrigated land. And then there is the harvesting of Dead Sea minerals, not only for the cosmetics with which we might be familiar, but for industrial elements which are rare and therefore very expensive. The authors of the study point out that Area C, which is 61% of the West Bank and was to be handed back to the Palestinians according to the 1993 Oslo Accords, is important because it connects Areas A and B, and it is the only contiguous land in the West Bank. Infrastructure is needed, and preferably designed in a manner which runs in the most efficient way. Currently, restrictions can increase distances and therefore the cost. The opportunity exists for the EU, as an important partner with Israel and one which says it upholds human rights, to use the economic relationship to encourage Israel to release the restrictions on the occupied Palestinian Territories. However, there is no mention of this in the reports on a recent delegation of more than 60 business leaders led by European Commission Vice-President Antonio Tajani to promote business in Israel. Worse: reports are that Tajani indicated that the EU will soften its approach to its own guidelines on eligibility of Israeli entities active in the areas occupied by Israel since 1967. As these guidelines were a first important step to turning EU words into action, any softening would be a catastrophic undermining of the EU’s own credibility. Not to mention the backwards step in terms of human rights for people living in the occupied territories outside of the Israeli settlements. The EU describes itself as one of the largest donors of aid to the Palestinian territories, but the World Bank report shows that the need for aid will decline with removal of restrictions and the potential to develop their own economy. This is surely more sustainable for everyone in an economic sense. Although QCEA supports the development of a circular economy based on concepts of reuse decoupled from resource use, and questions the concept of endless economic growth, the problem here is quite different. Administrative obstacles inhibit the promotion of human well-being by restricting the use of the available mix of natural resources and human creativity. This is not acceptable. And administrative restrictions are certainly not equitable when they are applied to people with one kind of political or ethnic identity, and not to others.